"This is Julio from RGV Thunder 10U. I would like to thank you for all your help in designing our pins. This is our first time doing pins and my parents, the girls on our team, and our coaching staff were all very pleased with your work. We appreciate all the time and effort you spent on speaking with me and helping us get exactly what we were looking for. Again we are very pleased and overjoyed with our pins. We will make sure to recommend your services to others and hope to do business with you company again next year. Thank your for your hard work in pleasing your customers." "I would like to once again, thank you for the teriffic job that you and staff did on the trading pins. They were a huge success for our families and other team at the AAU tournament in Rochester, MN. To give you an update on the results of the 2013 AAU National Championships 12U- Girls Divison I...the Fairfax Stars 12U won the National Championship for the 3rd year in the row. This is quite an accomplishment, because no team EVER on both the girls and boys side has done this. We will be definitely using your services next year. Maybe the pins will say " Three-Peat/3peat...3 Time National Champions." Thank you for checking with us at TradingPins4Less.com. 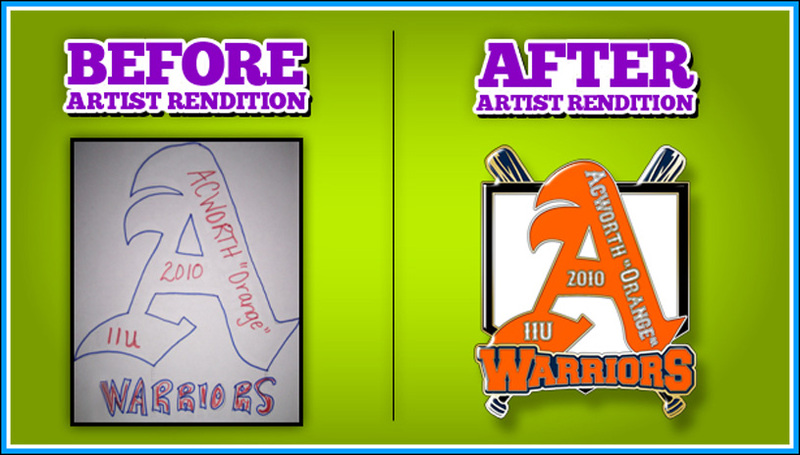 If you play sports and/or have ever held a custom trading pin, we probably made it! We’ve been making custom soft enamel, offset printed, and photo etched trading pins for decades and 2019 is shaping up to be another great year! We have carefully selected Trading Pin types and sizes that have historically dominated and continue to rule at Pin Trading events with respect to tradability or "Trading Power". The pin sizes, quantities and styles shown on this site make up the "Sweet Spot" of the Trading Pin market segment. We specialize in all team sports including baseball pins, fast pitch softball pins, soccer pins, hockey pins, umpire and coach pins, Cooperstown pins, Odyssey of the Mind and many others. All of our pins are produced quickly and ship via UPS or FedEx Priority Air Delivery. This service is included in our pricing which some might find unbelievable. Please browse the pages of our website and either call us Toll Free, or email us through our Free Quote Form with your design requests and a member of our highly trained staff will give you a formal quotation and create a digital proof of your team pin design! It's just that easy so why wait any longer? Contact us Now! June 1 through August 31 there will be no delivery guarantees implied or offered between this time period.